One of the very best aromatic cigars money can buy. A smooth smoking and mild cigar with a slight aroma of vanilla. Arango offers an Ecuadorian wrapper and binder, and a filler blended of Dominican and Honduran tobaccos. Exceptional construction, quality, and blending. 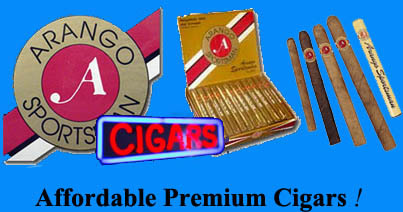 Excellent cigars at ridiculously low prices! NOTE: #100 NATURALS & #200 NATURALS CURRENTLY BACKORDERED FROM FACTORY.